Desperados, the Heineken-owned beer brand, scooped this year's award for Grand Prix with its ambitious, far-reaching and immersive festival, which included DJs playing in hot air balloons. "SkyFest" was staged in La Seu in Spain in September 2017, against the stunning backdrop of the Pyrenees. Devised by agencies We Are Pi and Jack Morton Worldwide and produced by Elrow, it was designed for both a digital and live audience. The event featured world renowned DJs including Jackmaster, Honey Dijon and Paco Osun, performing high above the ground in seven hot air balloons, to thousands of partying members of the public below. These included 250 specially-invited influencers; they also attended a pre-event experience to help amplify the activation, featuring two themed room drops, experimental music workshops and an interactive, conductive ink lightshow installation. On the night, a live feed shared Instagram stories from Desperados, Elrow and hundreds of user-generated posts from the partygoers, including short films showing different participant perspectives. There was also an immersive Facebook Canvas experience and a YouTube hack where consumers could 'play' the installation at home. 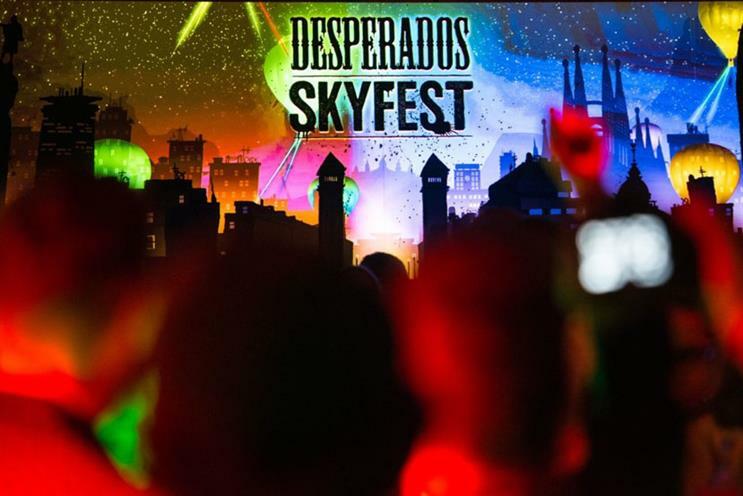 With over 67 million views, SkyFest was Desperados' most watched and shared content ever. There were 729,900 engagements with #skyfest and #desperados, 305.9 million potential reach and 250,000 video views through Elrow's coverage. Electronic music platform Resident Advisor called SkyFest "a once in a lifetime immersive experience".